An antique print entitled "The Champion of 1885" produced for the famous Victorian Magazine "Vanity Fair" founded by Thomas Gibson Bowles which commenced publication in 1869. For about forty five years caricatures of famous and infamous personalities were carried in the weekly issues of Vanity Fair. Subjects included Royalty, judges, politicians, musicians, sportsmen, artists, actors and criminals of Victorian and Edwardian Britain. This print by 'Spy' was published on 4th April, 1885. An antique print entitled "He might be Champion if there were a Championship" produced for the famous Victorian Magazine "Vanity Fair" founded by Thomas Gibson Bowles which commenced publication in 1869. For about forty five years caricatures of famous and infamous personalities were carried in the weekly issues of Vanity Fair. Subjects included Royalty, judges, politicians, musicians, sportsmen, artists, actors and criminals of Victorian and Edwardian Britain. This print by 'Spy' was published on 25th May, 1905. 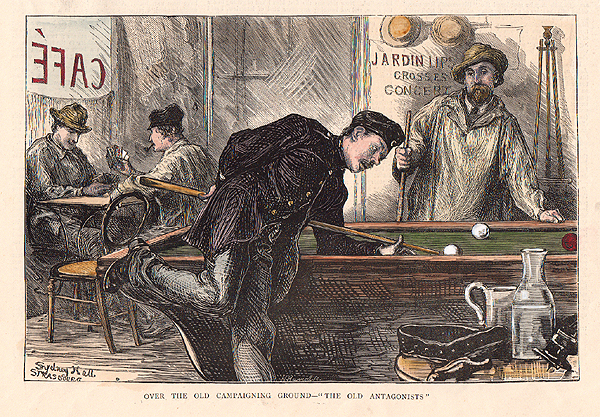 The Great Billiard Match between Collins and Peall at the Royal Aquarium. More Info An antique woodcut engraving entitles 'The Great Billiard Match between Collins and Peall at the Royal Aquarium - Peall making his great break of 2,413.' which was published in "The Graphic" on November 13th, 1886. An antique woodcut engraving entitles 'The Great Billiard Match between Collins and Peall at the Royal Aquarium - Peall making his great break of 2,413.' which was published in "The Graphic" on November 13th, 1886. 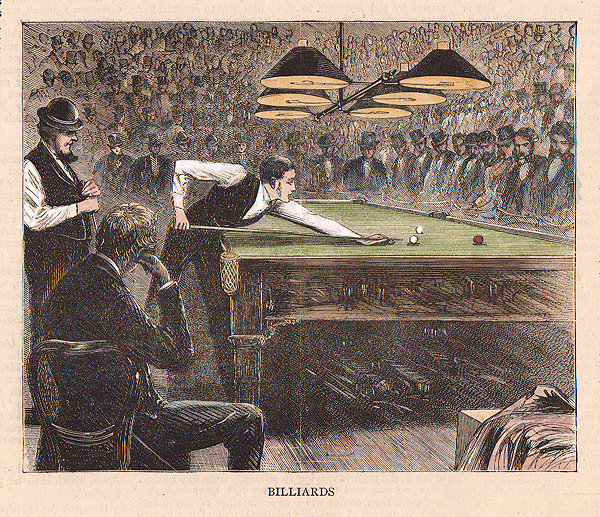 Billiard Match for the Championship at St. James's Hall. An antique woodcut engraving which was published in "The Illustrated London News" on February 19th, 1870. The colouring is later. The scoreboard in the top centre of the engraving shows the names Roberts and Cook. A woodcut engraving prepared for "The Graphic" newspaper and published on February 19th, 1870 Coloured by hand. An antique woodcut engraving entitled 'Over the old campaigning ground' - "The Old Antagonists." Published in "The Graphic" newspaper on October 19th, 1872. Later coloured by hand.